When this blog was first dreamed up, it was originally going to be a joint project with my old work colleague and good friend, Tara (who has her own wonderful blog - For Your Random Knowledge). We ended up doing our own thing as she already had two blogs on the go, but last night she came over and cooked me dinner, which made for a semi-collaborative post. I didn't actually do any cooking - I just stood with my back to the sink with a wine glass in my hand and talked while she prepared a delicious meal - but I did take the photographs. First, make the tomato sauce (recipe here) and spread half of it over the bottom of an oven-proof dish.. Then par-boil the cannelloni tubes for 5 minutes and then drizzle with a little olive oil to keep them from sticking together and allow to cool. Turn the oven to 190°C and while it is coming to temperature, mix all the ricotta, the parmesan and about half the mozarella together with the egg, lemon juice, half the basil leaves, shredded, and a little salt and pepper in a mixing bowl. Stuff each cannellini tube full of the ricotta and mozzarella mix and then place in the oven-proof dish on top of the tomato sauce. 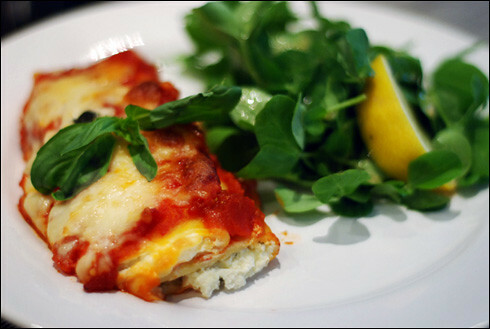 Pour the remaining tomato sauce over the cannelloni and finally scatter the remaining mozzarella over the assembled dish. Bake in the oven for around 30 minutes and serve with a nice, green salad - Tara brought over pea shoots, which we then dressed with vinaigrette (recipe here) and washed this down with a delicious Rioja. thank you! i drooled over it when it was made for me, so i can highly recommend it! there must be ways around it? non-egg cannelloni stuffed with spinach, aubergine, soy yoghurt/silken tofu, pine nuts etc, covered in tomato sauce? i think if you play around with the tofu you can probably get a texture similar to ricotta. it just means playing around a bit!